Can I get an impression without integrating with my system? Yes. You can try our simulation utility to simulate application log generation. This will allow you to get started right away without touching your production system. 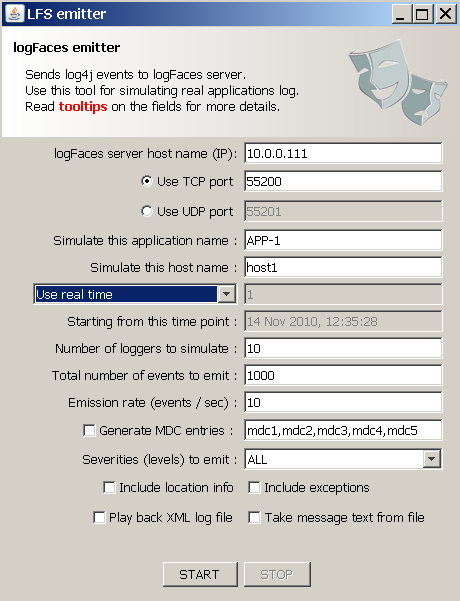 logFaces emitter is a small utility with user interface where you can simulate various scenarios and work directly with logFaces server. You can get it from here and run anywhere on your network. User interface is shown below, the usage should be straight forward - you define input parameters and hit START button. Emitter will then start sending log statements in accordance with parameters specified. We use emitter for our internal testing and decided to give it to users to simplify integration process.